Good Hips are Essential to a Doberman's Lifetime Fitness. Know the Difference. Choose the Method Right for You. NOTE: In the industry, breeders and owners casually refer to standard x-rays done to submit to the OFA as "OFA hip exams". The exam and x-rays are taken by veterinarians across the USA. The OFA reference simply reflects the purpose of later submitting the x-ray to the OFA for review, grading and if passing, an OFA number. OBJECTIVITY. 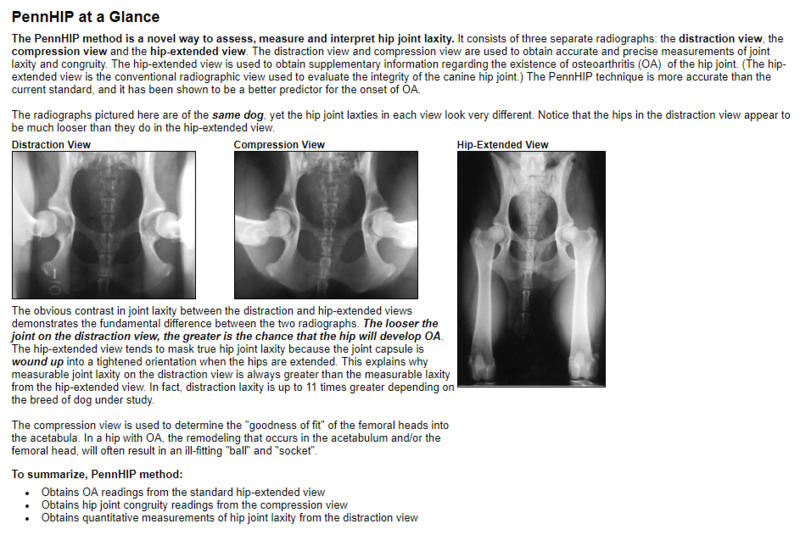 The OFA grades/judges x-rays submitted to them, using a small panel of radiologists who report their subjective impressions of the dogs’ individual hip conformation. The x-rays being reviewed are performed by veterinarians with widely varied skills/expertise in positioning. Why it Matters. ​It is not uncommon for a single dog to get very different hip results. This is because each time an x-ray is taken, the dog's position is likely different. The OFA panel can only judge the x-ray before them, and as such, different x-rays can net different OFA hip grades. This range of possible hip grades (for the same dog) often results in "hip exam shopping". When poor results are obtained on the first set of x-rays, breeders frequently have more x-rays taken (either from the same vet or a different one) in the hope that a better grade will come from different positioning. Note that each x-ray must be paid for, making repeated standard x-rays for OFA submission more expensive than PennHip. Moderate: the ball is barely seated into a shallow socket. There are secondary arthritic bone changes usually along the femoral neck and head (remodeling), acetabular rim changes (osteophytes or bone spurs) and various degrees of trabecular bone pattern changes. Severe: Marked evidence that hip dysplasia exists. Ball is partly or completely out of a shallow socket. Significant arthritic bone changes along the femoral neck and head and acetabular rim changes. Why it Matters. The hip grades of excellent, good and fair are within normal limits and are given OFA numbers. This information is accepted by the AKC on dogs with permanent identification and is in the public domain. Radiographs of borderline, mild, moderate and severely dysplastic hip grades are reviewed by a team of consultant radiologists and a radiographic report is generated documenting the abnormal radiographic findings. Unless the owner has chosen the share their problematic results, dysplastic hip grades are hidden from the public. COST & AFFORDABILITY. OFA hip exams are normally considerably more affordable than PennHip exams, if the exam is done once. OFA requires a simple fee for evaluation and certification on one X-ray. Many vets don’t sedate or anesthetize for this X-ray, depending on the dog, reducing the cost of the exam. Why it Matters. If A breeder chooses an OFA hip exam in the hope of saving money, but the dog receives an unfavorable hip score, most breeders will want to get another reading/exam by either the same vet or another vet. Another exam means another bill. Paying for multiple OFA exams often makes OFA exams more expensive than a single PennHip exam. WHAT IS DONE WITH THE RESULTS? The OFA’s approach effectively allows veterinarians to select the best images for submission to the OFA and/or decline to submit poor quality hips for evaluation. Why it Matters. The ability to decline to submit poor results to the OFA database skews the database towards better results. This selection bias permitted by the OFA renders the database relatively useless to scientists, and at a minimum, misleading since poor results are often excluded (never submitted). EARLY PREDICTION OF FUTURE DISEASE. The standard x-ray method does not purport to accurately predict future disease. Moreover, OFA hip exams are done beginning at two years of age. Why it Matters. Hip screening is done for two purposes: breeding-clearance purposes and for the purpose of eliminating heritable hip disease. OFA exams serve only the first purpose -- breeding clearance. AGE OF DOG AT TESTING. OFA hip exams are done beginning at two years of age. Why it Matters. Testing at two years of age means many dogs will enter the show ring before their hips are evaluated, increasing the chance that poor hips will enter the genetic pool through award-based incentives. Also, waiting until two years of age to test a puppy, means that the common two year breeder guarantee of no heritable disease expires at the moment the dog is finally old enough for an OFA hip exam. EASY ACCESS TO TESTING/AVAILABILITY OF TESTING LOCATIONS. Any veterinarian with an X-Ray machine can perform OFA hip exams. As a results, it is easy to find a vet who can do this exam on your dogs. ​Standard OFA hip exam results are accepted by the OFA. Passing hip grades based on standard x-rays will be issued an OFA number which is accepted by the AKC. OBJECTIVITY. Penn HIP patients’ X-rays are assessed via objective measurements. Why it Matters. ​ PennHip scores are known to be very consistent, regardless of the examining veterinarian. Repeated exams result in the same hip scoring. While more expensive initially, PennHip is usually more affordable than repeated OFA exams where the breeder is not happy with the hip result of the first examining veterinarian. PENNHIP GRADE CLASSIFICATION (SCORING) SYSTEM. From three radiographs taken to measure the hip joint laxity, a score between 0-1 is assigned, with 0 being very tight hips and 1 being very loose. The test is not pass-fail, and the score is actually based on a measurement of the hip’s distraction index (DI). According to the organization, "the DI is an indication of the ‘percent out of joint’ that the femoral head is displaced from the acetabulum." So a DI of 0.15 means the femoral head is 15 percent out of joint (a tight hip), and a DI of 0.77 means the head is 77 percent out of joint (a pretty loose hip). The index is measured using circular gauges that are placed over the films, and the final number reflects factors such as the size of the dog and how it compares to the rest of the population. This method generally defines a DI of ≥0.30 as "osteoarthritis-susceptible," and a DI of ≤0.30 as "osteoarthritis-non-susceptible." COST & AFFORDABILITY. PennHIP requires the dog’s owner to commit to an entire service package: anesthesia, three X-rays and the evaluation fee. Add more fees to reimburse the veterinarian for his or her certification status and PennHip quickly becomes more expensive than a single OFA exam. Often two to three times more expensive. PennHiP evaluation is more costly than a OFA hip exam, except where multiple OFA hip exams are done in the hope of getting subsequent, more favorable readings. Why it Matters. ​Because PennHip scoring is so consistent, breeders pay for just one reading because additional readings will yield the same rating. WHAT IS DONE WITH THE RESULTS? PennHIP requires veterinarians who examine hips with PennHip to submit the resulting X-rays to a database of cases, regardless of hip quality. This improves not only the value of the database, but its value to dogs at large for its more accurate representation of the real incidence of hip disease within the breed. Result accuracy for individual dogs are continually refined as more enter the database. Why it Matters. Because all results are included in the database, researchers can better understand breed-wide hip fitness and tell you where your dog's hips lie (in comparison), within the entire database of other Dobermans. More importantly, having this data collected in a central location makes it possible for PennHip scientists to continually refine the methodology making it increasingly accurate. EARLY PREDICTION OF FUTURE DISEASE. ​ PennHIP exams can be done as early as 16 weeks for an accurate prediction of future changes to the hips. This ability to exam your pup is one of PennHip's advantages. Why it Matters. Breeders can screen early, and avoid investing resources into a dog who has poor hips. AGE OF DOG AT TESTING. ​ PennHIP exams can be done as early as 16 weeks for an accurate prediction of future changes to the hips. Why it Matters. Breeders can screen early, and avoid investing resources into a dog who has poor hips. Puppy owners can identify heritable hip conditions before the common two-year guarantee of no heritable conditions has passed. ​The number of PennHip certified vets is low compared to the number of Vets who can perform OFA hip exams. PennHIP vets are certified only after completing a one to two day course. Many areas have no Veterinarians certified in PennHip nearby, making OFA hips much easier to access. OFA will add PennHIP results to the OFA database. The OFA does not issue OFA numbers based on this request, but will simply list the results. To add PennHip to the OFA web site, you mail to the OFA a $25.00 service fee, a copy of the PennHip test results, and a note asking that the data be included in the OFA database. ​Note that CHIC has added PennHip to the list of accepted exam results.